Usher in the Year of the Sheep with a safe and reliable driving experience this Chinese New Year. 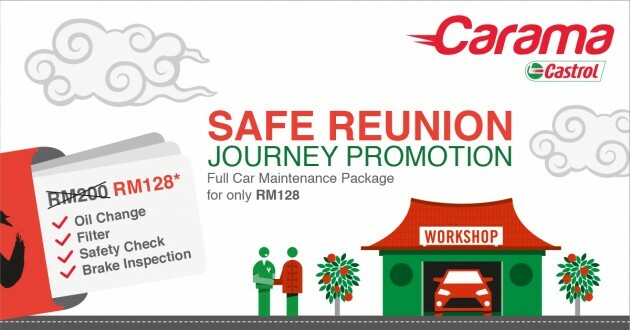 Malaysia’s first online service for trusted car care, Carama by Castrol, is offering a safe reunion journey full car maintenance package at any of its workshops. For just RM128, you’ll enjoy an oil change with four litres of semi-synthetic oil (inclusive of oil filter, in the case of Proton and Perodua cars 1600cc and below), a 15-point safety check and brake inspection that includes an inspection of your disc pads, brake line, calipers and rotors, brake shoes, drums, air cleaning and topping up of the brake fluid if necessary. Here’s how it works. Visit Carama, and type in the location at which you would like to have your car serviced. Select your preferred workshop and click ‘Book Now’. Fill in the necessary details, enter the promo code CNY128 and submit your booking. All you have to do next is present your generated voucher at the workshop on the day of your appointment. The promotion is applicable at over 200+ workshops listed on Carama. Click here to proceed, and don’t forget to use the promo code CNY128!